Abstract: This useful little device can support two USB printers on either a wired or wireless network. There's nothing glamourous about a print server, but they are a very necessary device in the small office, or any place that wants to save the expense of network capable printers. Why use a print server? Well, do you have a PC to spare as a dedicated print server in your office? If not, then you'll have to use someone's work PC to share your printer(s). This is fine until you start running into the periodic crashes, slowdowns and interruptions that plague the typical office computer under heavy usage. Not to mention the fact that every once in a while, the person responsible for the printers is going to need access to the print server, disrupting whatever work is currently being done on it. 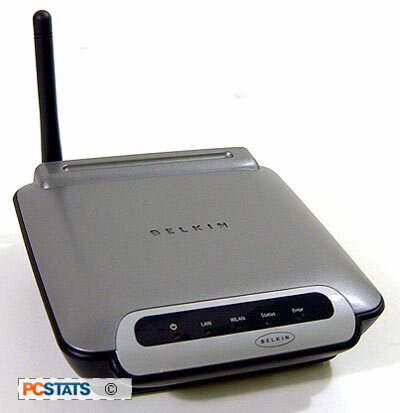 In this article, PCstats will be reviewing the new Belkin 802.11g 2-port USB Wireless Print Server. This useful little device can support two USB printers on either a wired or wireless network (but not both, more on this later). This is a dedicated print server, not a router with some extra functionality. It's intended for small office environments and comes equipped with WEP encryption to safeguard the privacy of your documents (and your ink) when then are transmitted over a 54Mbps 802.11g connection. AC power adaptor, Network Cable, software, printed instructions. As we mentioned, the Belkin 2-port USB Wireless Print Server supports 802.11g wireless connections for a maximum throughput of 54Mbit per second. It features a pair of USB 1.1 interfaces, which can each support a single independent printer. A web configuration interface, similar to what you would find on a home routing device, is included for setting up and controlling the device. The print server will accept dynamic IP addresses from DHCP servers/routers or it can be configured with a static IP. As a print server, Belkin's 2-port USB device supports printing from FTP and raw IP connections, as well as using LPR (Line PRinter) port. For the LPR option, the Belkin print server software creates a local printer port on your computer which is used to pass print data directly to the device. WEP is supported for wireless encryption, and the web interface can be password protected for safety. No password is used by default. There is a reset button on the back of the device which also doubles as a quick test button. When pressed it will print a test page to all attached printers. Unfortunately, parallel printers will not work with this Belkin Print Server, neither will the non-printing abilities of a multifunction scanner/printer/fax machine. The Belkin 2-port USB Wireless Print Server is a neat little plastic package, not much larger than a pocket book. A single dipole antenna protrudes from the back, along side the reset/test button that single 10/100 Ethernet port, two USB interfaces, and DC power connector. The only other distinguishing features are the row of LEDs along the front. From left to right, they are: power, LAN indicator, WLAN indicator, status light (used to indicate printing in progress) and an error LED which lights up to indicate a printer error (or the lack of a printer). The package includes the driver and installation CD, an RJ45 patch cable, the power adaptor, a quick guide and a slender operating manual. The manual is brief but fairly well written and illustrated. It covers the necessary bases. The CD includes several programs for enabling systems to work with the print server, as well as an auto-install process that binds them all together.